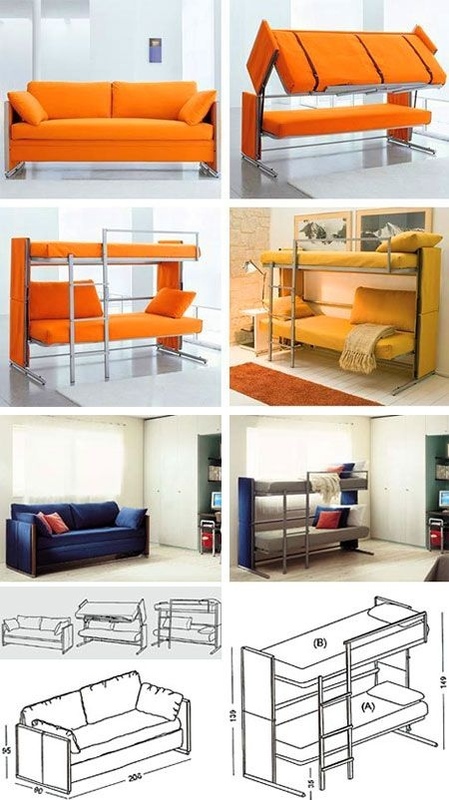 There are several different approaches in creating an ingenious space saving bed for a home of modest proportions. 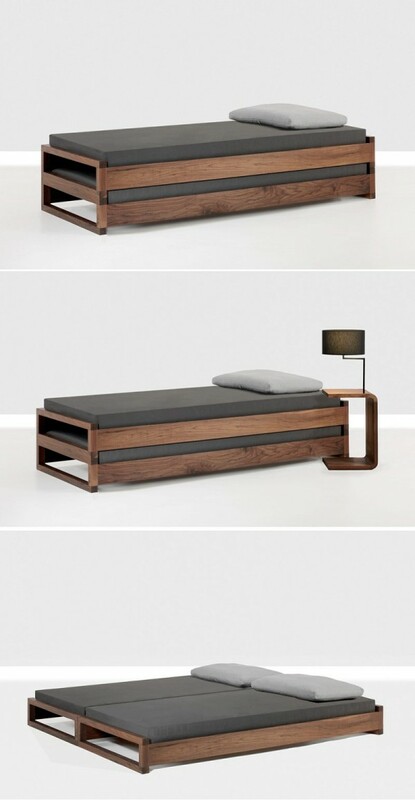 The most straight-forward designs involve clever positioning of the bed, creating a slumber spot in a space that you would not normally consider using for this purpose-or otherwise. 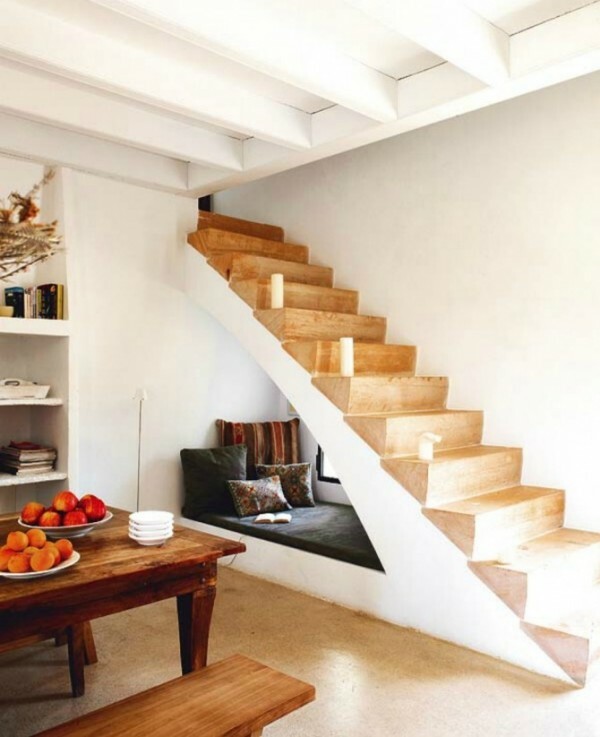 One example of simple space repurposing would be to utilize the unused area under a staircase, like this cozy double bed set up. The custom made platform bed fits snugly into the under-stair alcove, and the design also incorporates under-bed and over-bed storage that runs straight into the side of the stairs too. The under-stair area also works great for hideaway day beds/reading nooks like this one. Bunks under a sloping roof, like in this loft space, are a great solution where precious floor space is eaten by a central stairwell. 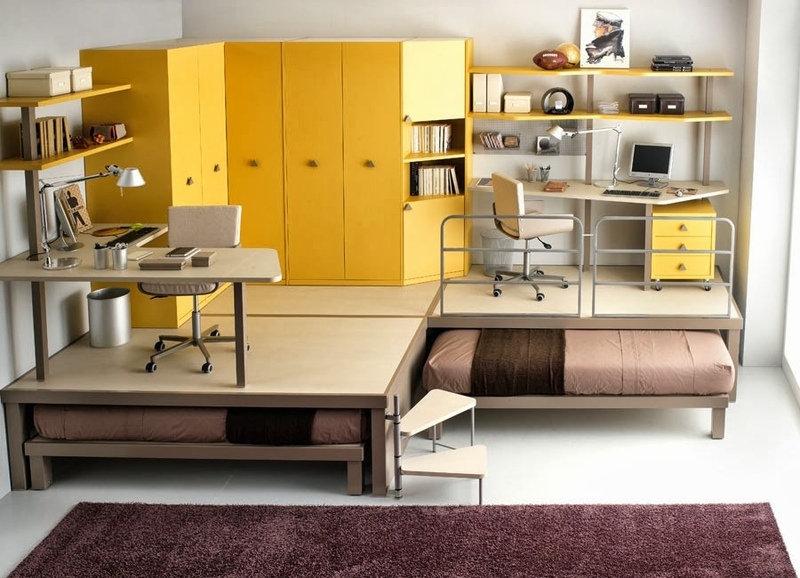 This particular example also incorporates a set of space saving storage shelves in each bunk cubby. 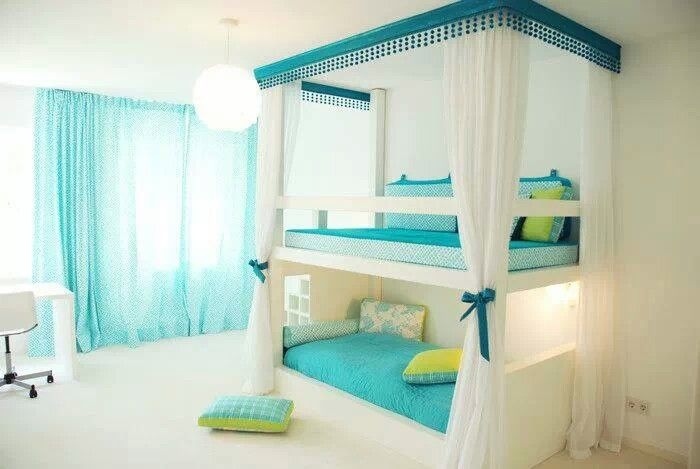 Bunk beds make full use a rooms vertical space, and make better use of the floor space than a set of twin beds. This elegant set takes on the characteristics of a four poster bed complete with canopy, and transforms into a double decker of day beds during the daylight hours. This bedroom harbors four beds but still looks to have masses of floor space. 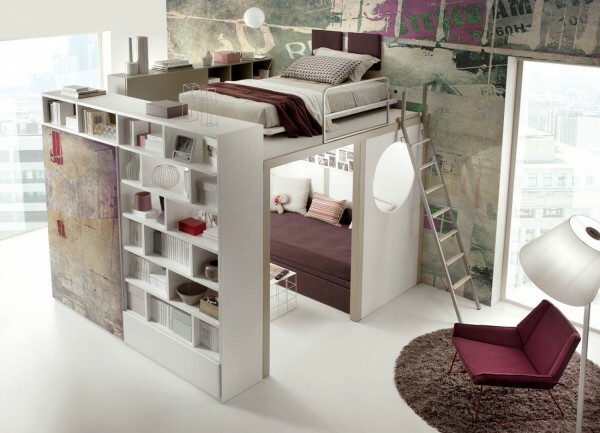 The centrally placed ladder becomes a design feature rather than a hindrance, and the clean crisp lines of the bunks almost become moment of contemporary architecture. Generally, when you move the bedding space up, you are be able to find room for a lot more things. 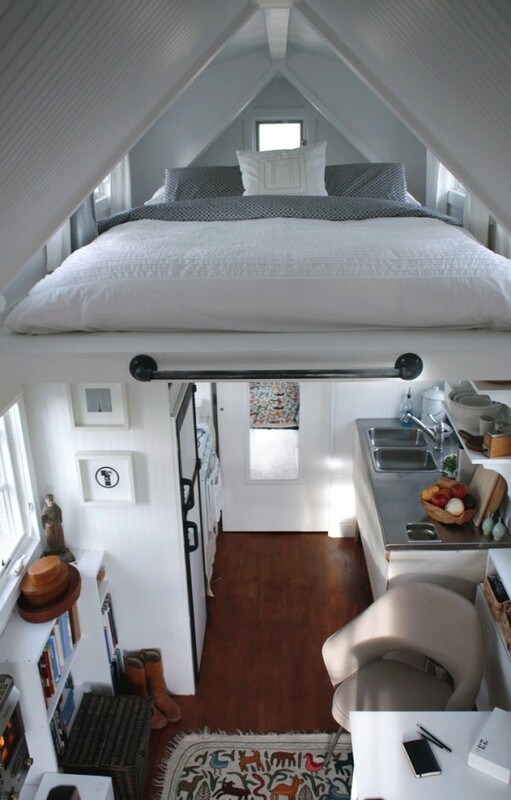 Storage shelves, a clothes rail and even a wash basin find a home under this high shelf-bed; the arrangement here also makes nice use of the high placed windows. 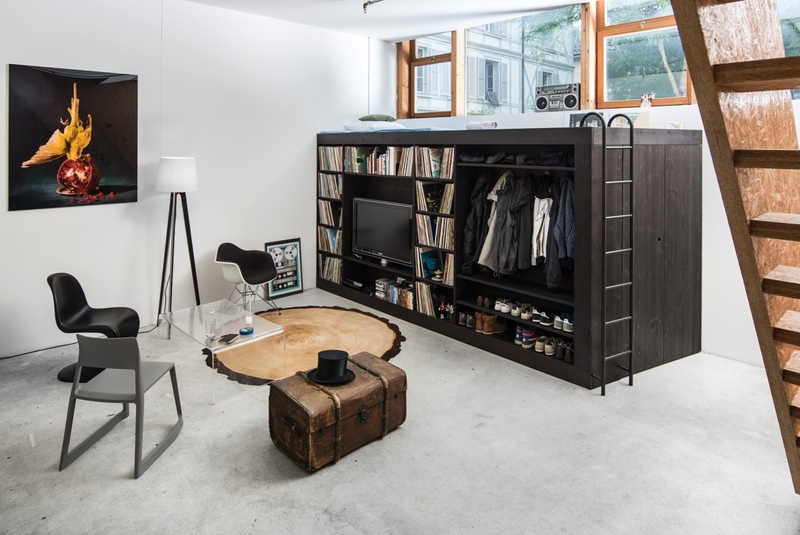 This adult cabin bed makes room for a home library and media cabinet, which allows the extra gained floor space to become a lounge and entertainment area. 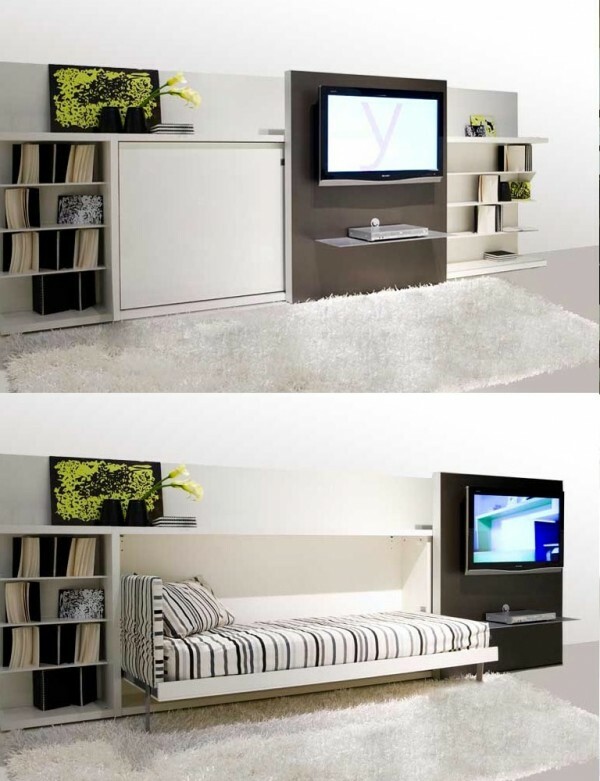 A dual use makes a small bedroom feel like a much more luxurious suite. Another variation of moving the bed ‘up’ is to completely conceal it within the ceiling, where you might not even notice, or recognise it. 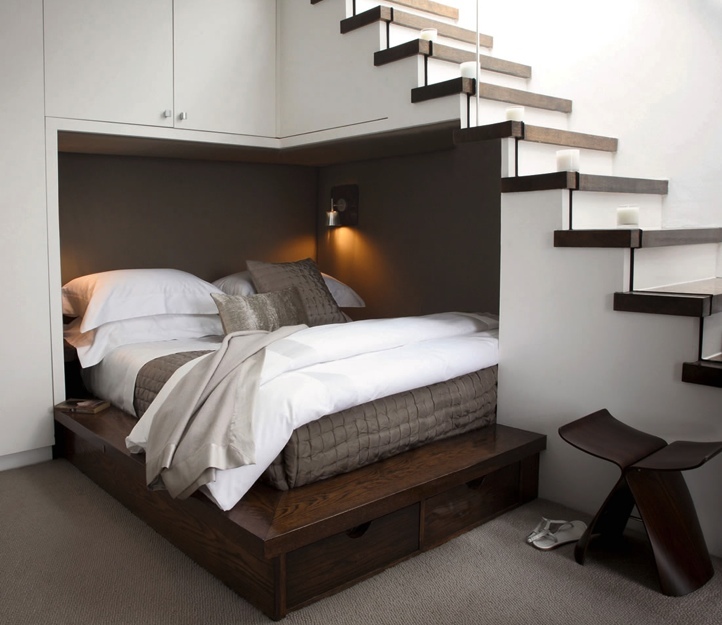 This suspended bed designs appears almost as an architectural feature, whilst the solid staircase leading up to it gives the sleep space a permanent and sturdy appeal. 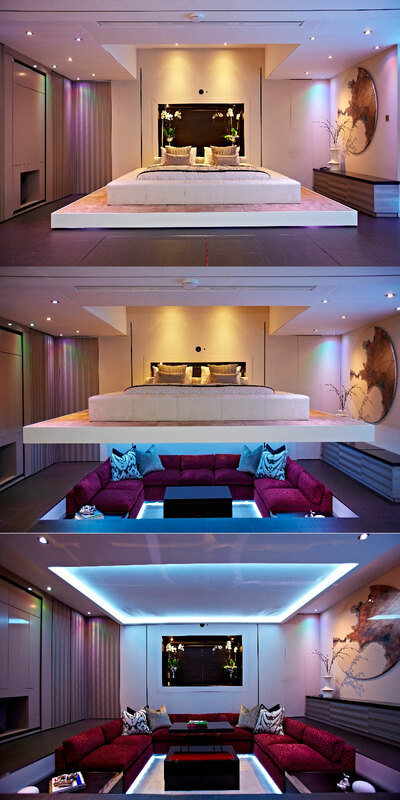 The skylight would make this a very bright place to wake up in the mornings, but if those window panes are made of clear glass then the view of the stars would be mesmerizing. Sleeping up in a nest like this may feel a little strange to some, but as there is a bath tub in the dining room of this home, we don’t suppose the homeowner minds a little touch of the extraordinary! 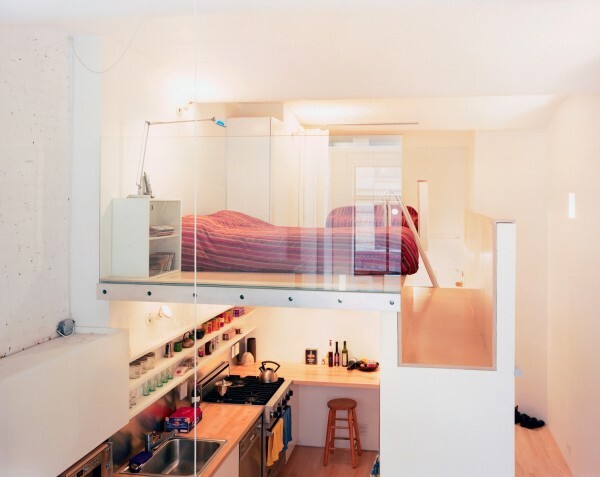 A mezzanine level is a winner in double height homes for all sorts of uses, but a bedroom hidden in the rafters is one of the best. 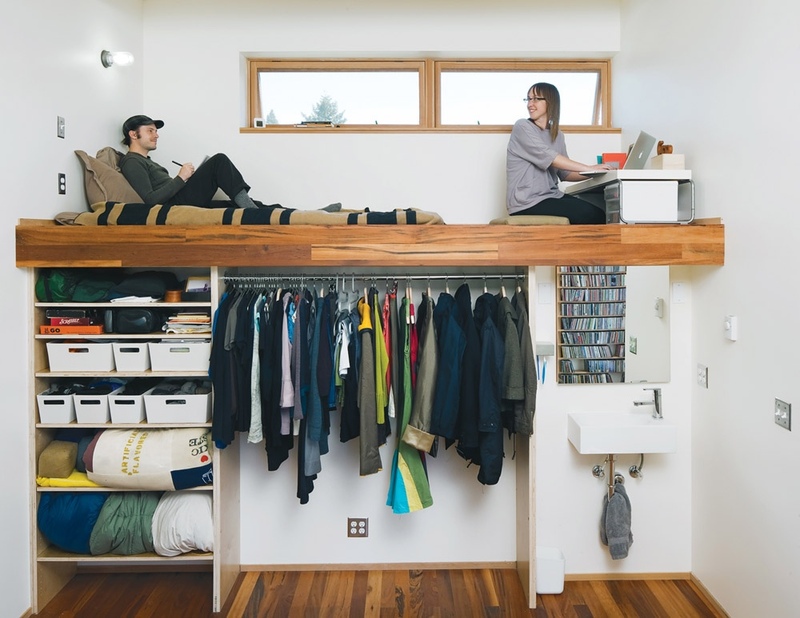 Even a half mezzanine can be more than big enough for two. 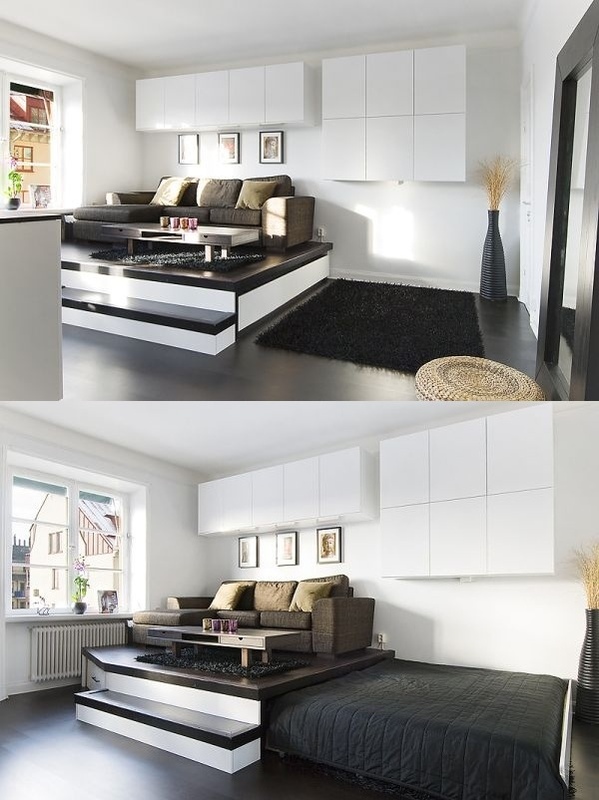 This one is like a room within a room. 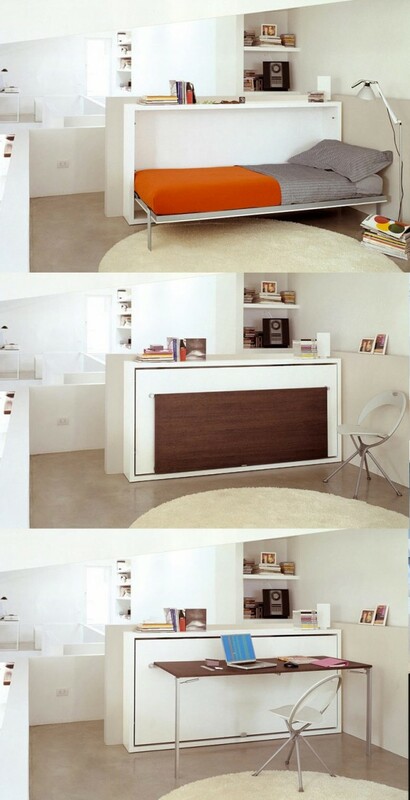 Another alternative to hiding beds in the ceiling is to put them under the floor, like this roll away trundle. 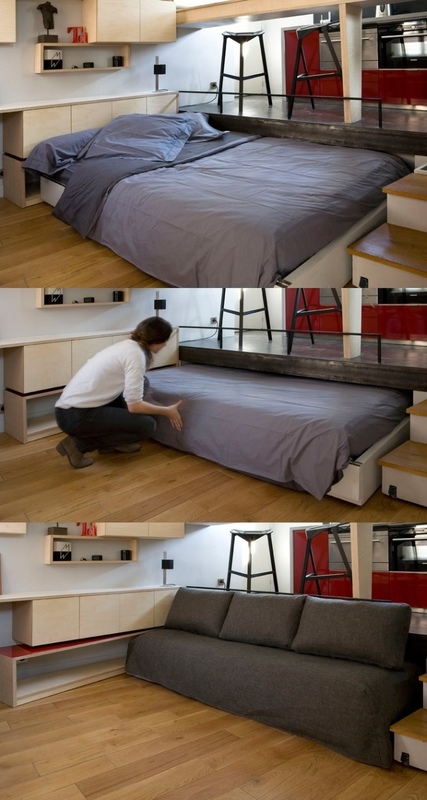 With a roll-away bed, a teenager would have to find somewhere else to hide their dirty dishes and laundry! 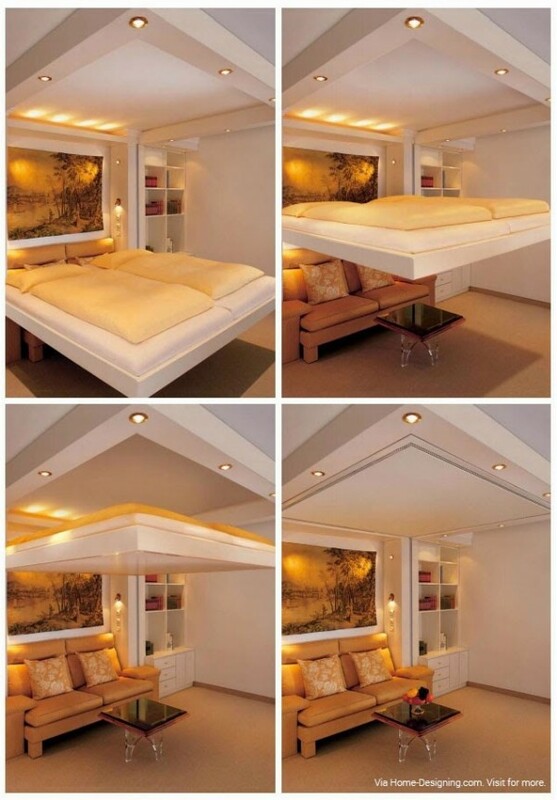 Raising the room above the bed, rather than the bed above the room. 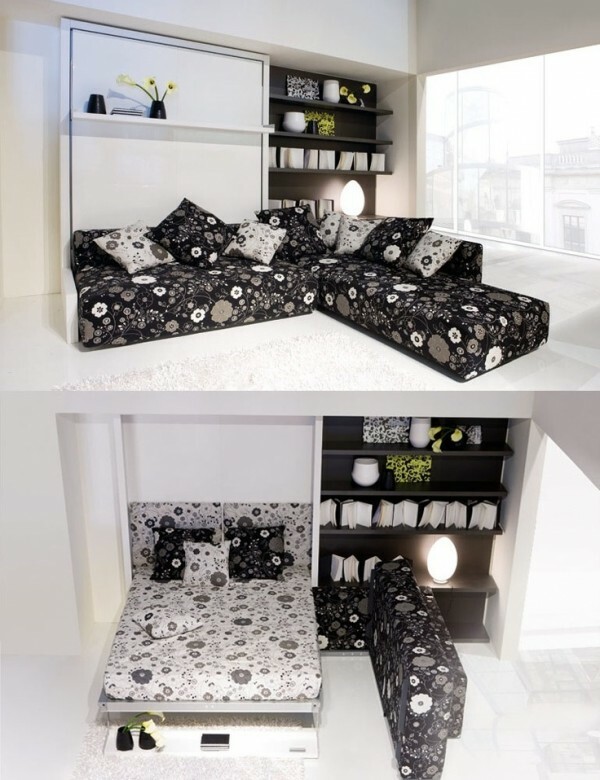 A very different take on the sofa bed. 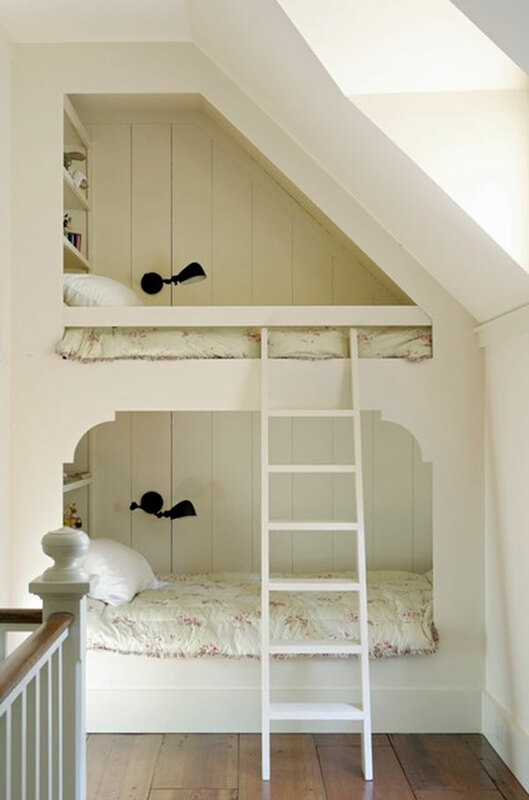 We have explored hiding beds under the floor and up the ceiling. What is left now? The walls, of course! One big name that keeps popping up when looking for murphy beds, or space saving multi-purpose furniture, is Resource Furniture. Though the concept of Murphy beds has been around for a while the newer designs are sturdier, sleeker and pack in multiple features. They can pop out of anywhere! 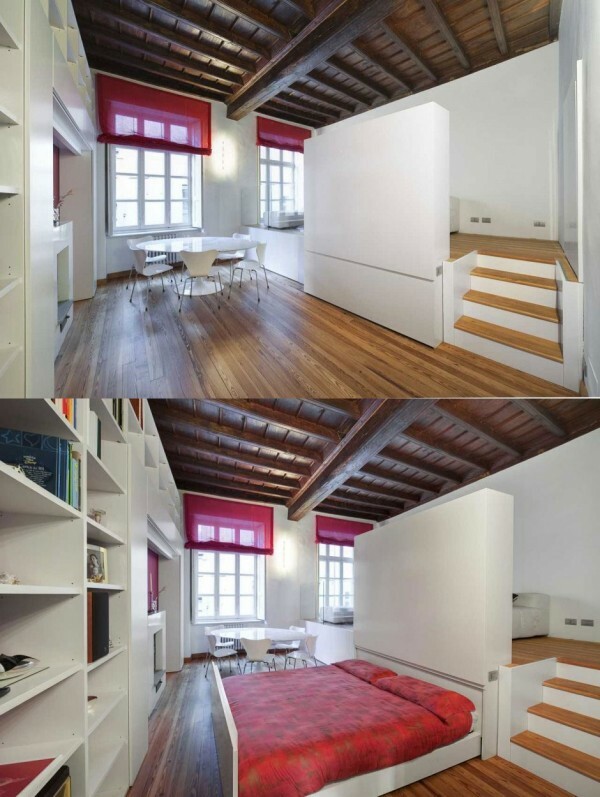 Who needs a guest bedroom when any wall will do? 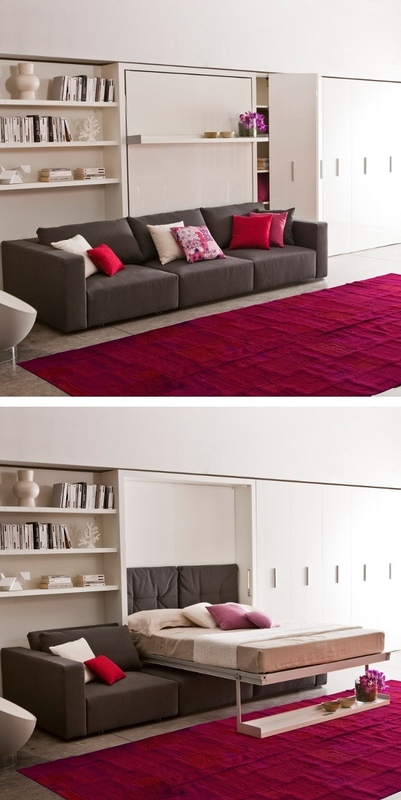 Even the most slender of spaces offer a solution. 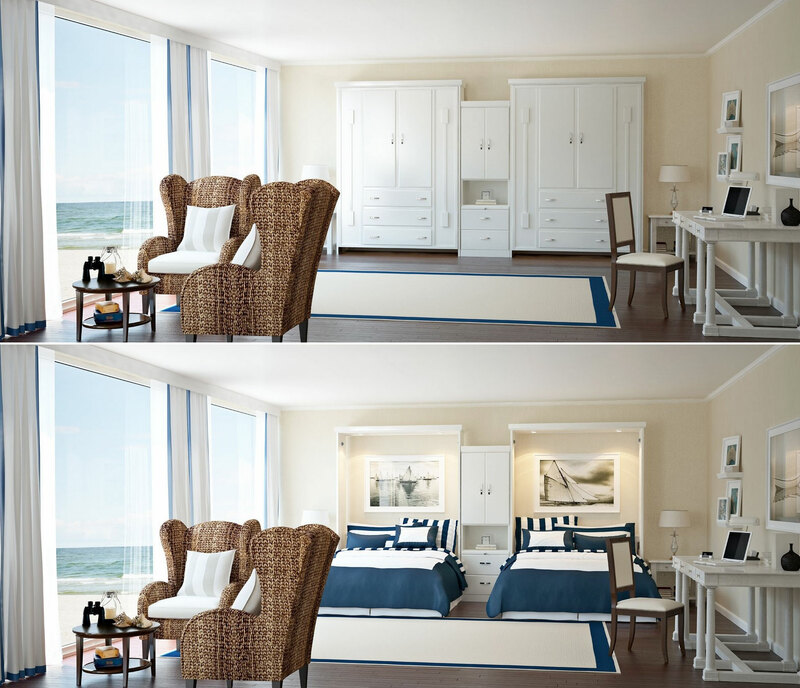 These twin doubles are disguised as attractive closets with faux door and drawer fronts. 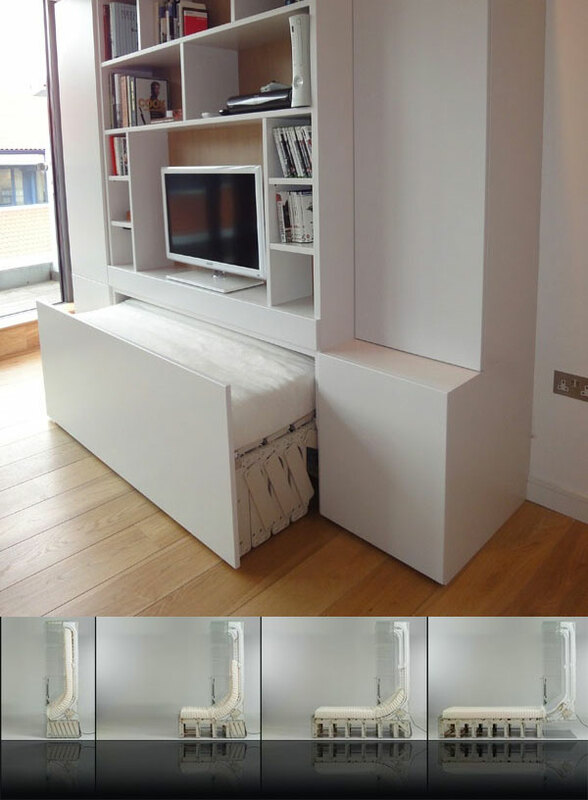 Flipping the mattress takes on a whole new meaning with this Work Bed that turns over to reveal a desk. 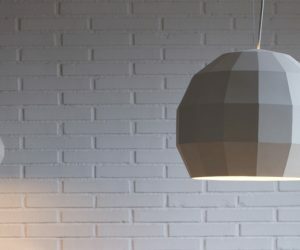 40 Unique Bedroom Pendant Lights.